I remeber reading a “letter to the editor” in the local newpaper. This was around the middle of 2008. Shortly after this a second letter appeared. Both letters were about the approaching centenary of powered flight in Australia. From the letters, I gathered that the first controlled powered flight of an aircraft in Australia had been made by Harry Houdini, at Diggers Rest, on the 18th March 1910. The aeroplane that he flew had been a French-designed and built Voisin II Biplane, which he had bought and shipped to Australia. All of this had been unknown to me. Having had my curiosity aroused, I began to search the internet for more information. Soon I had become absorbed in the story of Harry Houdini's flights at Diggers Rest in the Shire of Melton. Some time later, the Melton Council decided to get a group together to look at the possibility of making this historic event into a Centenary Celebration; a lot of the impetus for this move having come from the people of Diggers Rest. I immediately went to the Shire Offices and offered to be on this committee. I remember being thirty minutes late to the inaugural meeting at the Diggers Rest Old School Building. It always takes me a bit of time to get used to a new routine! At this meeting, it was suggested that some school students could be encouraged to build parts of the aeroplane. Knowing how difficult this would be, I volunteered my services to build a replica of the Voisin II Biplane for the Centenary Celebrations. Little did I know how difficult this task would turn out to be! I started my research, mainly using the internet and old magazines, in early October of 2008. I managed to obtain one page of three-view drawings and some useful articles from the internet,including pictures of the aeroplane, some with Harry Houdini in view. These would form the basis of my building instructions. I still have these materials in my album, together with some rough drawings and scribbles which Ihad found useful. I was now ready to start building. This commenced in early November of 2008. First was a trip to the local hardware store; the neighbour's station-wagon having been commissioned for this purpose. Then began the arduous task of measuring, marking, cutting and shaping the materials required for the basic fuselage shell. Putting the fuselage together commenced after the materials had been cut. I soon realised the enormity of the task that I had undertaken. Having settled for a nearly 4m long fuselage and a 3m wingspan, everything that had to be done became increasingly difficult, just because of the sheer size of the model aeroplane. It became even more difficult as the aeroplane took shape. 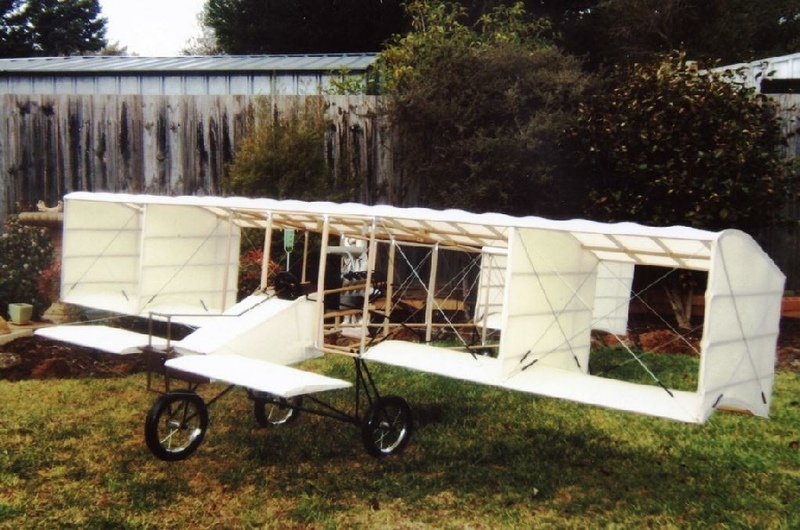 The construction continued; first the fuselage, then the tailplane and rudder, next the front elevators, the undercarriages (three of them; nose, tail and main), the wings, control systems, engine and on, and on, and on….. it seemed as if it would never come to an end! Fortunately, my wife Janice had the great idea of maintaining aphotographic record of each stage of the construction. This record, in a photo album, shows clearly all the stages of the construction. It is interesting to recall some of the difficulties which had to be overcome along the way. The sheer size of the model created many problems. I wish we had a larger garage! Often the choice of materials became an issue. The model is made of hardwood dowels, balsa wood, plywood, mdf, wire, steel rods, wheels taken from a pram and a stroller, rigid risers and polytube used in irrigation systems, control-line wire, one piece from a manila folder, cloth (and the tube around which it was rolled), clear dope, black paint, silver paint, mission-brown paint, bolts and nuts, aluminium foil, velcro and volumes of white glue, 5-minute epoxy and super-glue. In many cases, materials to be used were only decided upon after spending hours in the hardware store looking at all the possibilities. The photo album tells a lot of the story, but not all. The model was finally completed at the end of July 2009. It had taken 10 months and about 700 hours of work to get the job done. It is as close to the actual aeroplane that Harry Houdini flew as I could get. The wings had to be made so that they could be removed, in order that the model could be transported from place to place. It is not meant to fly, but is only intended for display. However, because all the control surfaces work, and because it is built accurately, with a good motor and radio-control system, it will fly if required! I must say that this project would not have been possible without the support of the Lions Club of Diggers Rest, who provided the finances. I also received great support from the Melton Shire Council and the Melton Model Aircraft Association Inc. I owe a great deal to my wife Janice for her patience and support right though the project. Will I ever do this again? Yes, but it will definitely be smaller!